Cape Breton Regional Municipality Mayor Cecil Clarke says any actions he took to facilitate a controversial port development deal were with council's blessing and any concerns raised by staff were investigated before the final vote. The 2015 deal that saw CBRM buy harbour property from Point Edward Marine and lease it to McKeil Marine Ltd. was dragged back into the spotlight last week during a constructive dismissal trial. The lawsuit was brought against the municipality by a former employee who says he was critical of the agreement. A document introduced in Nova Scotia Supreme Court in Sydney showed Clarke signed a non-binding offer in April of that year, two months before the agreement went before council to be ratified. During an interview Friday, Clarke said the document needed to be signed so the negotiating process could move forward. It outlined what the company was looking for and then allowed staff to determine if it would work, he said. "That is very clearly in the document," Clarke said in Halifax, where he was attending the Conservative Party of Canada convention. Clarke is also running to lead the Nova Scotia Progressive Conservatives. "It was accepting that this is what staff would follow up on and do the due diligence that was in place. So that is a normal course of business and a responsible thing to do." Clarke said he was granted "the overarching authority to develop opportunities for the port" by council. In this case he was simply acting in that capacity, he said. 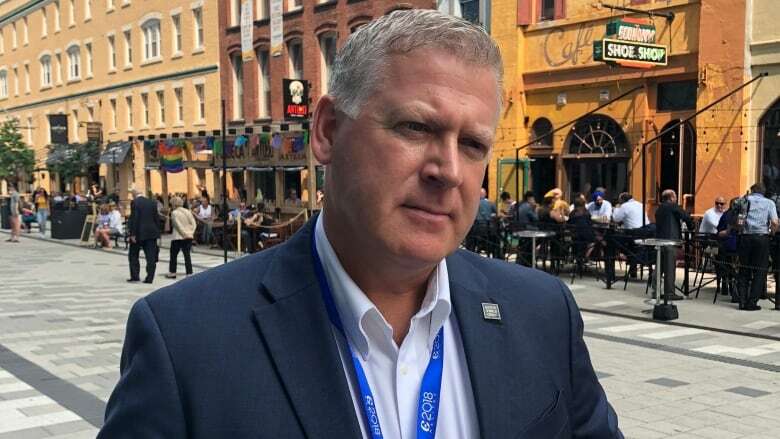 He acknowledged it's "atypical" for mayors to lead economic development files, but Clarke said an exception was made because of the municipality's dire economic circumstances. "Out of necessity, without provincial and federal leadership, council asked me to take that on," he said. "That's not out of the norm. In fact, that's what I would hope any responsible mayor would do when asked to lead a file." But several CBRM councillors said Friday news of the document signed by Clarke came as a surprise to them. Coun. Ray Paruch acknowledged council tapped Clarke to be its point person on the file, but said he thinks signing anything before it went to council was an overstep. Paruch said he remains troubled by the fact the municipality's chief financial officer at the time, Marie Walsh, recommended against the deal. "I can't sanction the stand taken by Mayor Clarke," he said. Deputy Mayor Eldon MacDonald said he, too, was surprised by the news. Like Paruch, he agreed council wanted Clarke to lead the file, but he said that should have ended at discussions without anything being signed. MacDonald and Paruch both voted against the deal. On Friday, MacDonald said he continues to believe it was a good deal for everyone except taxpayers. Several people who testified during the trial, including Walsh — who is now the municipality's CAO — said they had concerns about the deal, including whether it violated the Municipal Government Act because it provided a benefit for a private company. But Clarke said he had no concerns then or today about his actions. He said the deal resulted in "dozens of people working that weren't working before" and "millions of dollars being spent and further development of our harbour." When staff voiced their concerns in 2015, Clarke said he halted the process and called for an opinion from the province's Municipal Affairs Department to determine if everything was above board. Once they received the OK, Clarke said he got on with pursuing the deal. "You have to step back and look at what was requested by council and that was to do the overarching development for opportunities around the port," he said. "It was done in a businesslike manner and it was done in a manner appropriate to the Municipal Government Act and all appropriate due diligence was followed." A spokesperson for the Municipal Affairs Department would offer no comment on whether CBRM asked for the evaluation and, if it did, what the result was of the evaluation, citing the ongoing lawsuit.